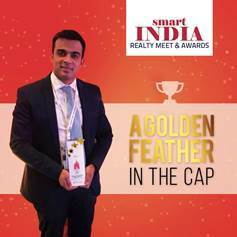 Sai Estate Consultants received the prestigious ‘Young Turk of Indian Real Estate Consulting Award’ at the CREDAI Smart India Realty Meet & Awards held at the World Trade Centre, Dubai. The Award was assessed by CRISIL which an agile global analytics company is providing ratings, data, research, analytics and solutions. The Smart India Realty Meet & Awards is a world of opportunities at one international platform which aims to celebrate the excellence of real estate between India & UAE. It is a platform where realtors, investors, channel partners, technology companies, etc. from India, UAE come together to discuss and ink new investment avenues in the Indian real estate sector. The journey of Sai Estate Consultants started 7 years ago with a small office and today it is fast-tracking towards creating an empire nationally and internationally. Amit Wadhwani started with just a couple of people in his team back in 2010. He now commands a team of nearly 200 people (50+ IIMs) and is valued at Rs. 900 crore. By 2019, he plans to float public issue, grow to a 500-member team and have an office each in 30 countries. Being ISO & CRISIL certified organisation, Sai Estate Consultants aims to redefine brokers and broking industry in the minds of the consumers. In the wake of the new productive disruption in the real estate sector such as RERA, Sai Estate Consultant became a RERA complaint firm and has enrolled 300 RERA compliant developers in its constantly expanding universe of trusted developers.